Scientific Name(s): Streptopus amplexifolius (L.) DC. Photographer(s) Appreciation: A special thanks to Anne Elliott for sharing this picture with us via the Botany Photo of the Day Flickr Pool. Streptopus amplexifolius is an understory species occurring in moist soils of montane and subalpine forests in the Northern Hemisphere. Most widely referred to as clasping twistedstalk, some other common names hint at its edibility: wild cucumber and watermelon berry. According to an article from the University of Alaska Fairbanks Cooperative Extension Service, the tender young shoots of clasping twistedstalk are prized in Alaska for their tasty cucumber-like flavour. These shoots make a great addition to salads or cooked with other fresh greens. Do note, however, that at early stages of growth, this species is readily confused with some of its poisonous relatives–positive identification is essential! The berries are also edible. When ripe, they take on a watermelon-like flavour and can be used to make jelly, syrup, or juice. These berries can also be eaten raw, but the seeds are known to have a laxative effect, so caution is again advised. The article from UAF also gives a comprehensive guide on how to process and preserve the fruits, along with recipes for extracting juice and making jelly & syrup! Preparing foods with native plants is a small venture I’d love to start one day, now that I’ve learned more about the many traditional edible uses of various plants native to British Columbia. This is one of the few plants native to British Columbia whose common name stuck with me when I first began to learn them. Clasping twistedstalk doesn’t roll easily off the tongue, but it is fun to say. After all, it’s still easier to say than its Latin name! The clasping part of the name is due to the sessile or epetiolate leaves attached directly to the stem. Although the stem can have a zigzag appearance like in today’s photograph, it is not the reason for the name twistedstalk. Instead, that is a reference to the twisted peduncle attached to the drooping flowers and fruits, which are attached to the stem at the leaf axils. This rhizomatous herbaceous perennial reaches approximately 0.4 to 1.2 m (~1-4 ft.) in height. A member of the Liliaceae, Streptopus consists of eleven species. It has only been featured on Botany Photo of the Day once before, when the berries of clasping twistedstalk were pictured as part of a wild fruit medley. 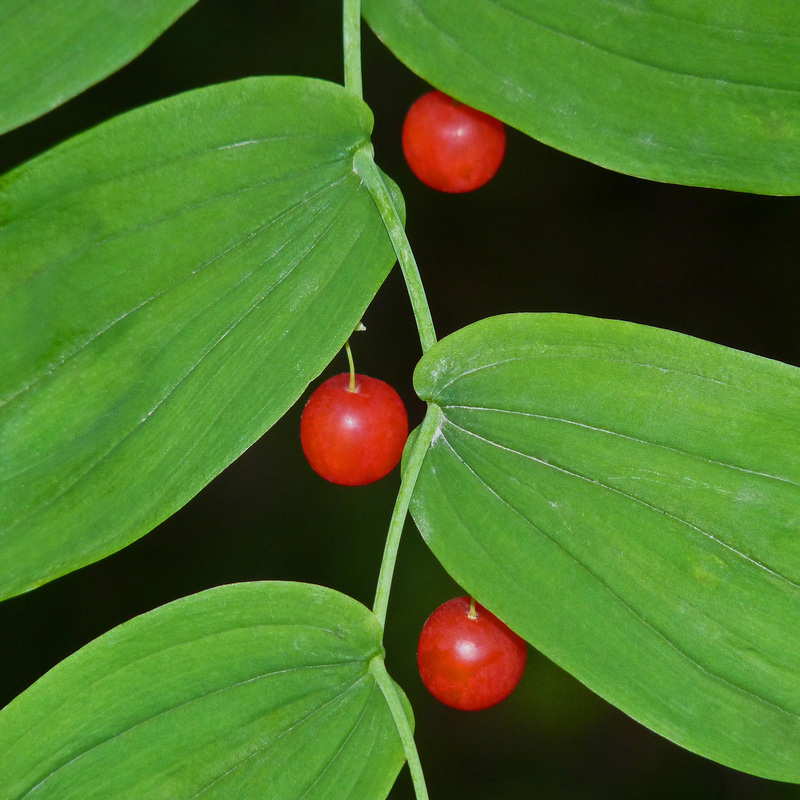 Despite its widespread distribution, the first ever report of a pathogen affecting a Streptopus species was published just over a decade ago (see: A newly described plant disease complex involving two distinct viruses in a native Alaskan lily, Streptopus amplexifolius). These previously unknown viruses are infecting several populations of clasping twistedstalk within Alaska. The paper notes further research is needed about the mechanisms of the viruses and the implications to other populations of this species. This photograph illustrates the essence of the plant while keeping the composition simple, sharp, and artistic. I also noticed that it was taken with a similar model to my old camera, but it far exceeds the quality of most of my old pictures. This reminds me of two important lessons I’ve learned about photography: study other people’s photographs for inspiration, and it’s the photographer that determines the photo, not the camera! I can confirm the watermelon taste of the fruit, having sampled a few many years ago on an Alaskan trip. I don’t know, the specific epithet seems pretty fun to say… amplexifolius. The genus kind of sounds like a sore throat though. A giant cephalopod with a sore throat? We seem to have the var. americanus here in Connecticut. Something new to look for in the woods. That’s kind of you, Anne–but I can’t take credit from Dominic, who was both the author for this entry and selector of your image!